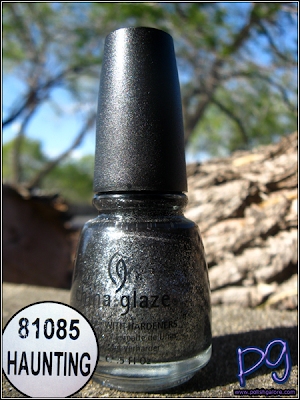 I went polish diving and pulled out Haunting, the name sake of the Halloween 2011 collection from China Glaze. This is a black creme with TONS of silver microglitter. The bottle is a bit deceiving though - there's much more glitter on the bottle than what comes out on the nail. I used a base coat of Rejuvacote by Duri, 2 coats of polish and a top of CND Air Dry. The formula was good. Full sun - see how there's still a good amount of black in there? It made me feel a lot better about this color, since the bottle looks more grey and not the kind of grey that I like. Finally indoors with the flash - honestly, this polish just rocks. I love that it's so different - unlike anything I currently own. If you can still find it (online, clearance racks), get it. You won't regret it. I recently got this polish in an order I made, so I'm looking forward to wearing it! It looks great.